It was very hard to not post anything last week while I had my giveaway up. I sure wish Blogger allowed you to create multiple pages for your blog. Seems to be it's biggest weakness from what I've read on the internet. Otherwise, I love it. It's extremely simple to use. Oh...it could use more templates, but that's another story. I have lots I want to share. This should probably be three different posts, but what the heck. I've got to catch up somehow. Now that I'm healed and feel so much better (and I've managed to keep off 5 pounds too), I want to show you our very cool room at the Inn at Red Hills. 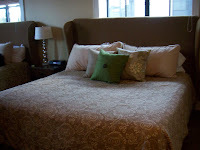 This was one of the king size Select Comfort beds with tons of pillows. 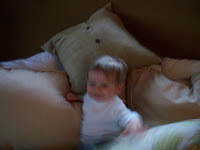 And this is a blurry picture of Austin, just loving rolling around in the pillows. He and I had some of our best moment frolicking on this pillows. He especially loved it when he was nakey boy. This is a picture of the trees in my backyard. Aren't they spectacular. 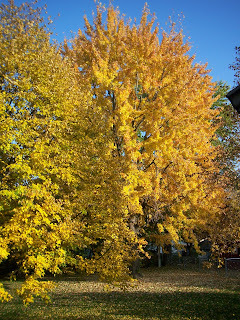 All these leaves have since fallen and now cover my yard, but for a few days my yard was just ablaze of color. 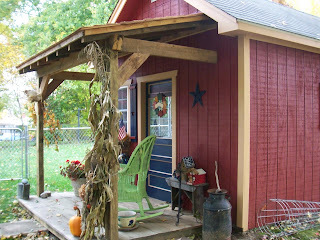 My next door neighbor has a little barn in her yard which she has never done anything with. It just sits there painted a brownish color and I never really much thought about it even though I see it every day. 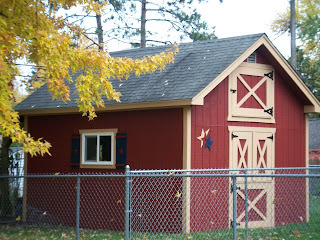 This summer I noticed my neighbors who live behind me where re-fencing their yard to incorporate the little barn. Being the interested sort...I ventured out to see what was happening. Seems Elaine just loves this little barn and proposed a purchase to the owner. They went to the city and the city okay'd it and now they own extra yard and a barn. Elaine has an eye for color and detail and loves gardening. Here is what she done to that plain little barn. Isn't it adorable. She's done such a great job fixing it up and decorating it. She plans on using it for her garden storage and to start her seeds in next spring. They installed a window on the far side of the barn (south) and she thinks it will ba great for starting seedlings. I agree with her. I feel very fortunate by these changes, because this is what I now see from my deck. Way better view. 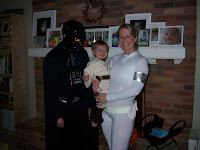 Here are some photos of our very Star Wars Halloween. Ryan you have to understand..."that this is all for you". And finally...to close out this post, a picture taken by Ryan. 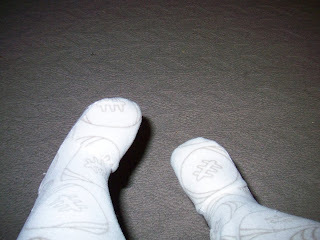 He was just giggling with delight when he showed me that he had taken a picture of his feet. This started a string of odd floor photos that have since been deleted. 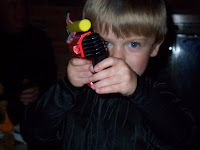 But he had so much fun. 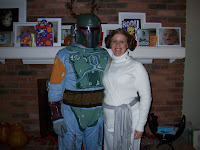 Great costumes... thanks for sharing these. Glad you are feeling better! I have missed some posts... I will have to catch up. Love those Halloween costumes. Fun! :) I like your view of the barn too. Thanks for the visit! Love the costumes! 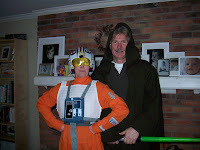 I'm sad we couldn't be there. I'm sure Ryan was in absolute heaven! 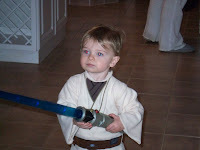 Your comment to Ryan - this is all for you - so funny and sweet! Sounds like a fun time. That's great that your neighbor allowed the other neighbor to have the barn! I wonder about the intricacies of that deal?